The regional staff of the Department of Immigration and Emigration were hosted to a Breakthrough Leadership Training at Sanctuary House on December 17th and 18th. 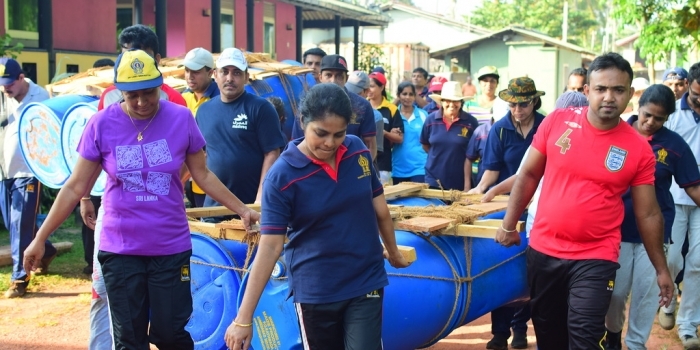 This training event was a combination of classroom lectures and outbound training for 50 staff from the regional offices in Vavunia, Kandy and Matara. On arrival at the venue on the 17th, the participants were warmly welcomed. Prior to lunch as well as post-lunch, Classroom sessions were conducted by the Training Manager of the Immigration Department and the Fingerprint Registrar introducing new procedures and technologies related to the issuing of Passports. The afternoon was spent on outdoor activities. 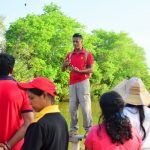 After a few ice-breakers the group was introduced to Mr. Mihin Amarasinhe the National Kayaking coach of Sri Lanka who instructed then in the basics of kayaking. Soon the entire group was excitedly participating. Some were initially very reluctant, but ultimately all were happily kayaking! 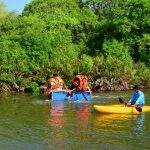 The finale was a kayak-relay race which was enjoyed by all. The day ended with a sumptuous Barbeque dinner on the lawn. The next day began bright and early. After a quick cup of tea, the entire group was ready by 6.45am. 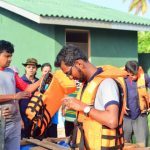 after some fun activities which helped them warm-up, Mihin took them through the Rafting Challenge. 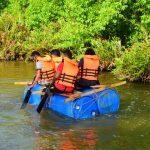 Divided into two groups, the participants had to use the minimal resources provided and construct two rafts. The rafts were evaluated for design and strength. Then the real test began; they had to launch and sail the rafts across the pond to collect two batons. The challenge was accepted and both teams set off. 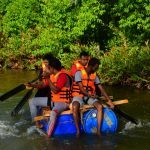 One team built up a remarkable lead over the first lap, but squandered it entirely during the changeover; the second crew of four toppled into the water as they unbalanced the raft while boarding. 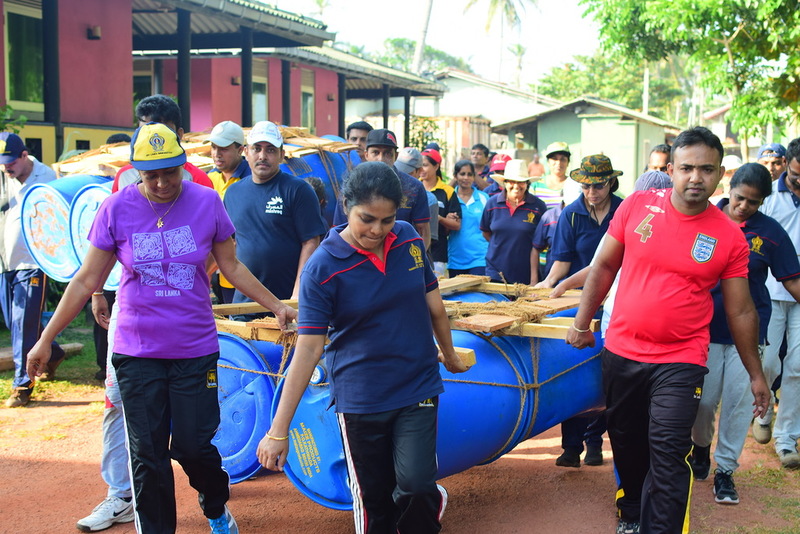 Ultimately both teams completed the challenge. 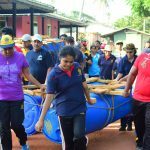 There were several lessons learnt and shared by the participants. After breakfast, experiential learning activities continued on the Low Ropes Challenge Course and allied activities. The participants faced challenges which simulated work conditions and responded innovatively and enthusiastically. 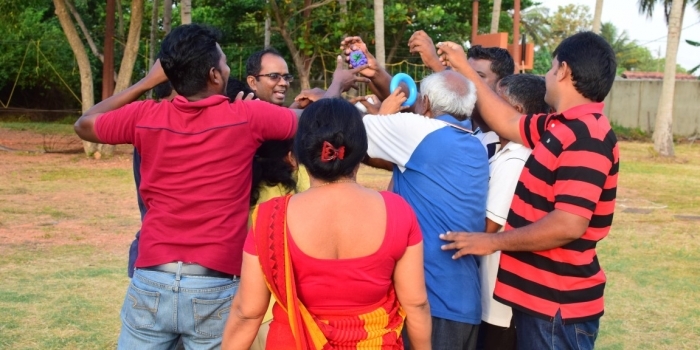 The Controller and Deputy Controller (Passports) who were present on the second day were impressed with the way the activities were facilitated and also easily connected to their work environment. The finale was climbing the Team Wall without any additional resources. The group chose a team of 9 and were able to complete this task, even though it initially looked completely impossible. The day finished on a high. 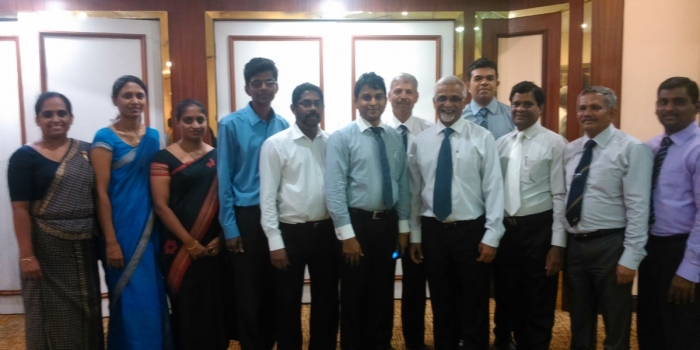 In December 2014, Sanctuary House and Breakthrough conducted a special one day experiential training program for Bank of Ceylon in partnership with Results Training.